With 7 days till the ride, the weather bureau forecast rain for the Sunday, but as the date got closer the diagnosis improved dramatically. Come Sunday, the weather was sunny but windy. 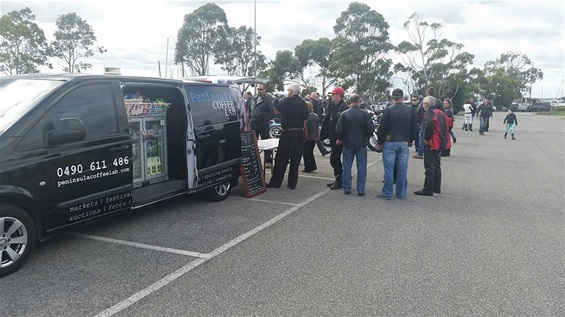 The CRAB crew rendezvoused at the Hastings Marina at 9.30 am and soon the coffee van arrived (thank goodness). It was all systems go. 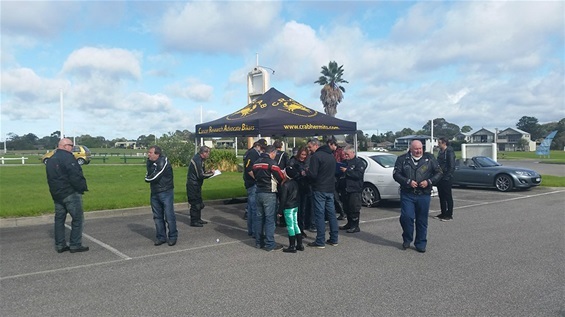 The club gazebo was set up in readiness and the bikes started arriving. Soon the car park was starting to fill with bikes of all descriptions. 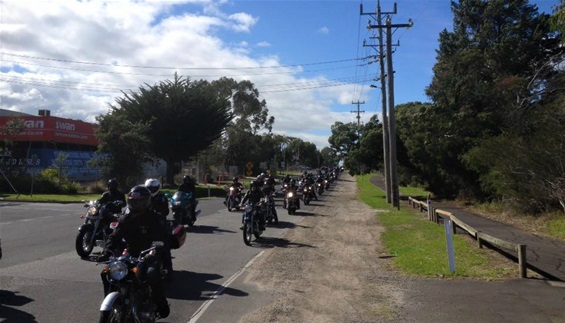 At a rough count, we had over 120 bikes on the ride. 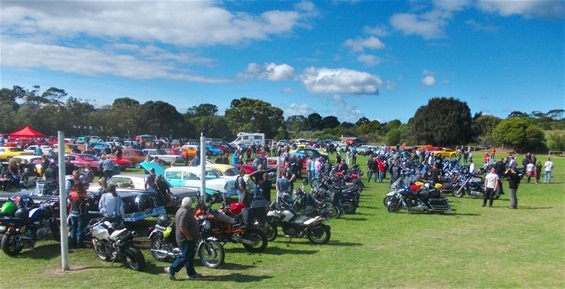 The long column of bikes turned many heads along the way as it meandered down the bay to the Rock ‘n’ Rods Festival in Rosebud. 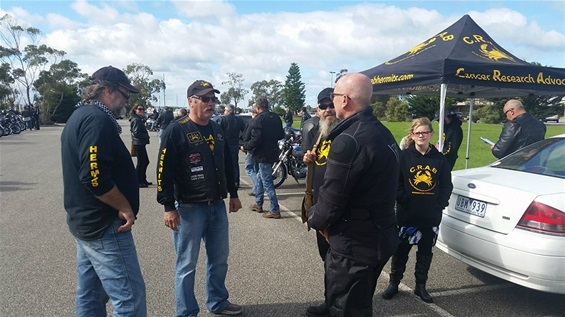 The second CRAB crew had already set up at the event and, once again, the roar from the plethora of bikes entering the festival stole the show. Once the dust had settled, the riders and pillions grabbed some lunch, enjoyed the music and wandered around the displays. 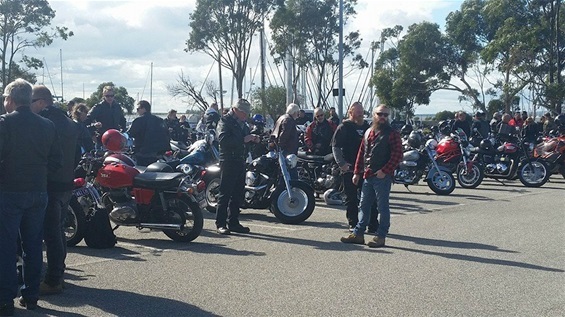 The ride was a great success for the CRABs and the weather held up well, although it got a little blustery along the cliff tops just out of Flinders and the wind at the Marina made registration “challenging”, but hey, it didn’t rain and at times it was quite warm. Many thanks to the club members and volunteers who made it all happen, the organisers of the Rock ‘n’ Rods Festival for allowing us to use their event as the ride destination, and thanks to the websites, facebook page owners, cafes and businesses who promoted the event.....and of course the biggest thanks has to go to the riders and pillions who participated on the ride to support a worthy cause. 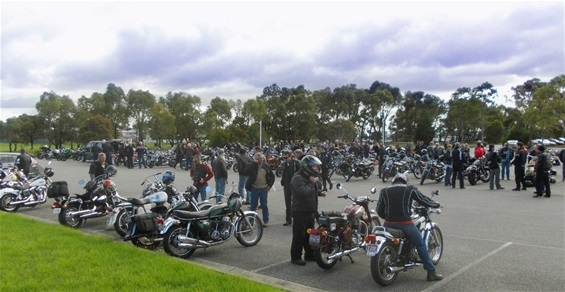 The ride proceeds will shortly be donated to the Olivia Newton-John Cancer Research Institute. The bikes at the Hastings Marina. Just after 10am and already the car park is starting to fill. The gazebo HQ in action. Bikes and bikers everywhere !! A quick meeting during registration. Thank goodness Simon came by car..it gave us something to tie the gazebo to !! The bikes at the Rock 'n' Rods Festival in Rosebud. Music and special effects by Stig Spielberg.